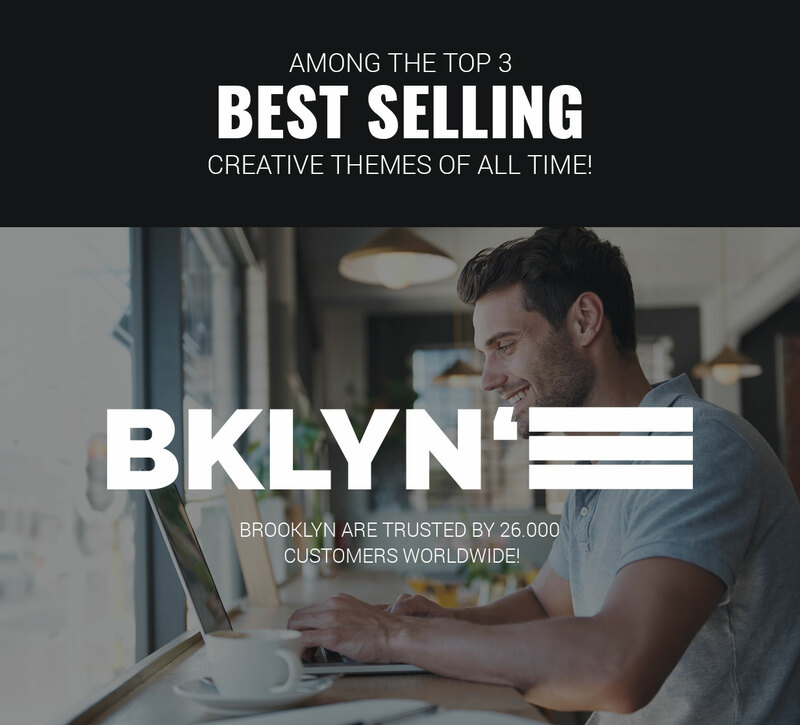 Brooklyn is a popular WordPress theme for any purpose with 42 complete pre-built websites in 1 click trusted and loved by over 30,000 users worldwide. 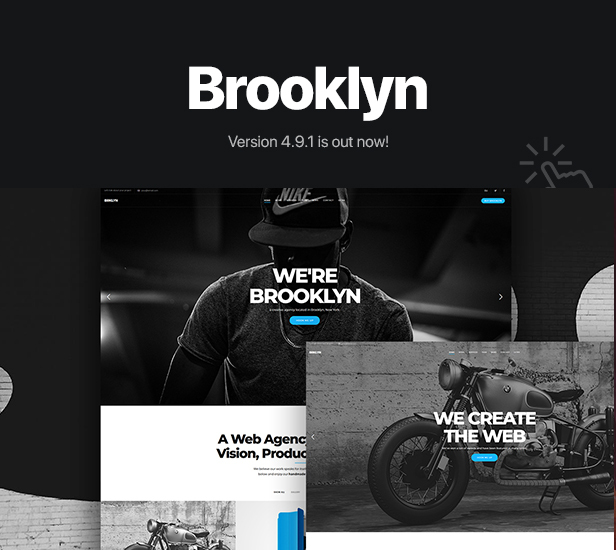 Brooklyn broke the mould with Hero Pages before Jumbotron was even born. 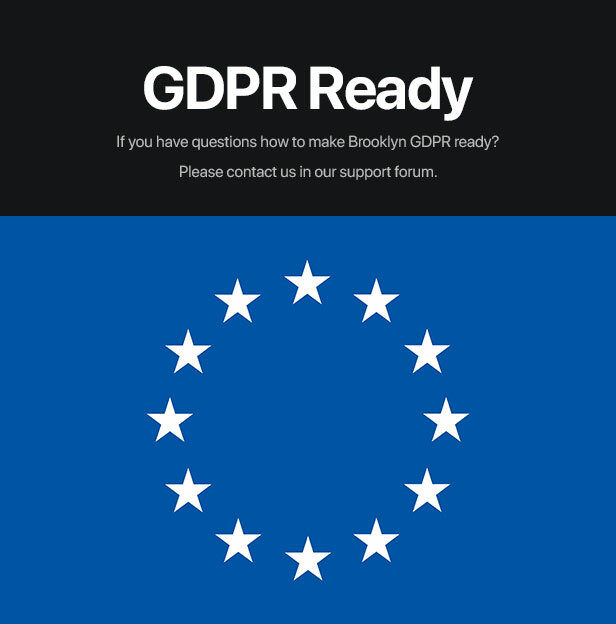 Brooklyn’s roots are founded in groundbreaking design and it continues to push the boundaries of what is possible with great design and WordPress. Get beautiful, swooshy web design in a one stop shop package that won’t break the budget, comes with a lifetime of free updates, incredible personal support and Theme that remains in the Top 3 best selling creative Themes of all time. 30,000 users can’t be wrong! 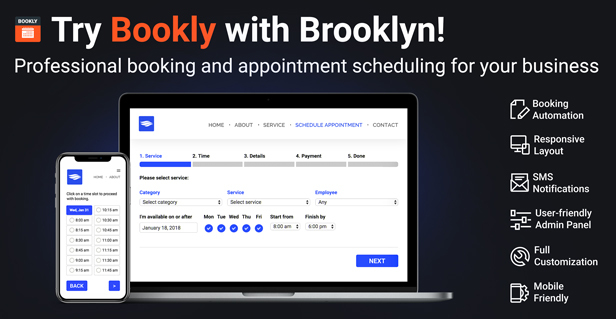 Brooklyn powers thousands of websites all over the world where designers and developers recognise the power it offers in a simple, convenient package. 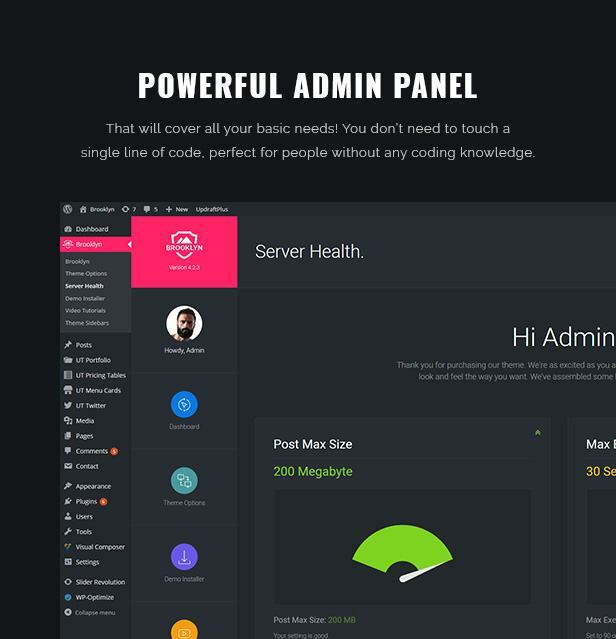 It’s easy to manipulate to make it suit your needs, doesn’t require any coding knowledge to create a truly beautiful website, and is supported by a SWAT team of WordPress ninjas who are standing by ready to assist you should you need technical support. Not convinced? Take a look at just a few of the killer websites that have been built with nothing other than Brooklyn and WordPress. The Demos in Brooklyn are backed by careful research into the requirements for each demographic. Looking into popular business websites we have carved out over 30 niche demo sites to help meet your needs quickly and easily. From Barber to Gaming, Weddings and Construction, Freelancer to Cryptocurrency we’ve got you covered. And there are a stack a generic style demos that can be easily modified to suit just about any purpose too. 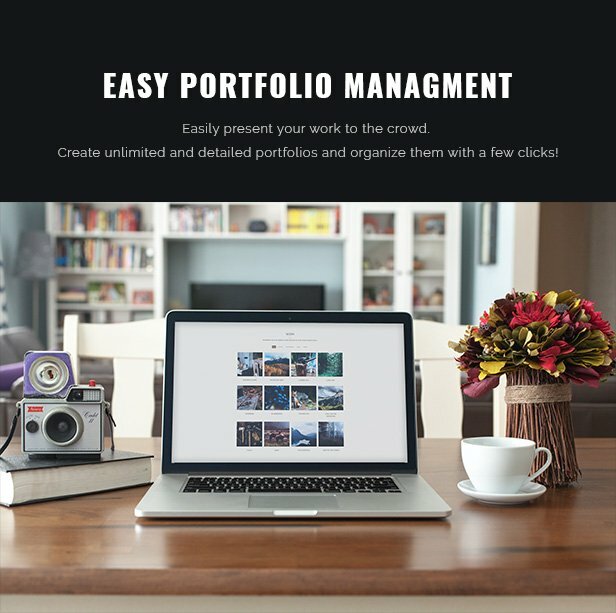 You’ll find slick one pagers, landing pages for Marketing, fullscreen video background, minimalist parallax effects, sliders – the works! Brooklyn doesn’t rely on XML files for one click installation. Taking users needs into careful consideration we took extra care in making sure that when we say one click installation, we mean one click. 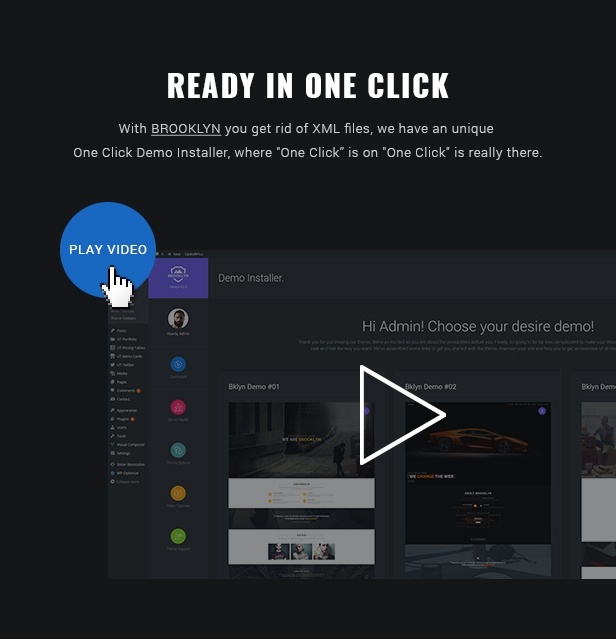 Import full demo styling with a single click for a better user experience and an easier setup overall, simply add your own content and images. No coding required, that’s a promise! 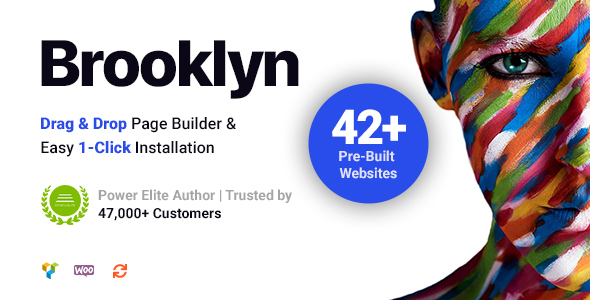 Taking your web design to new levels with Brooklyn and the #1 Drag & Drop Page Builder, WP Page Builder (formerly Visual Composer) included in the once off purchase price. Create almost any web element you desire with the Drag & Drop simplicity of the #1 top selling Plugin for WordPress, WP Bakery Page Builder (formerly Visual Composer). 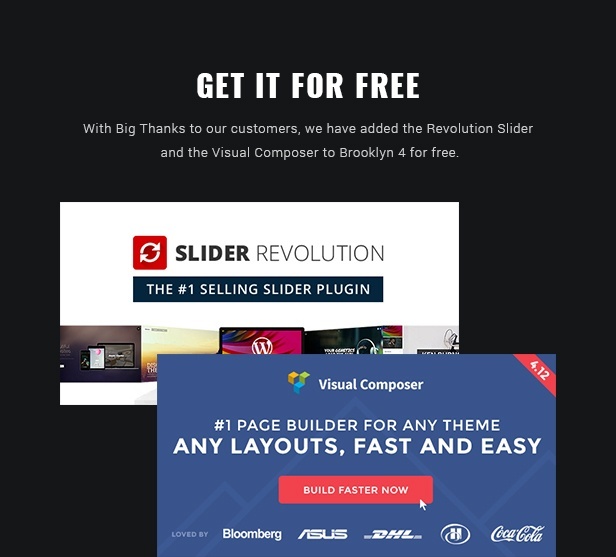 Slider Revolution – as they say, it’s not just a Slider Plugin, it’s a new way to deliver ideas! With these two killer Plugins working at full speed you can create any kind of layout you need, and it’s not rocket science, just drag & drop, baby. Ready to use Web Elements make your life easier, there is no other way to say it. That’s why Brooklyn comes jam packed with mega elements ready to use and reuse as you see fit. 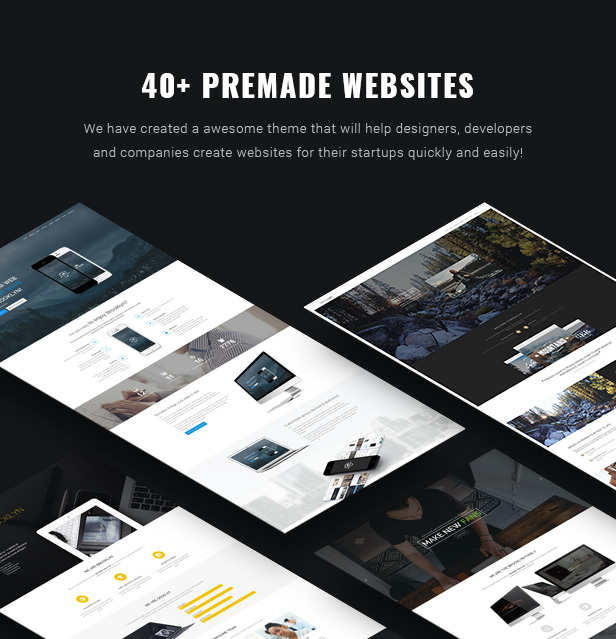 Over 185 Page Templates to get you started, 50+ strong block module for predefined WPBakery Page Builder modules, buttons, typography and Shortcodes to name just a few. You’ll find timeline elements, countdown timers, beautiful pricing tables, crazy CTA fields and big bold footer and header designs – all ready and waiting for your king kahuna content. 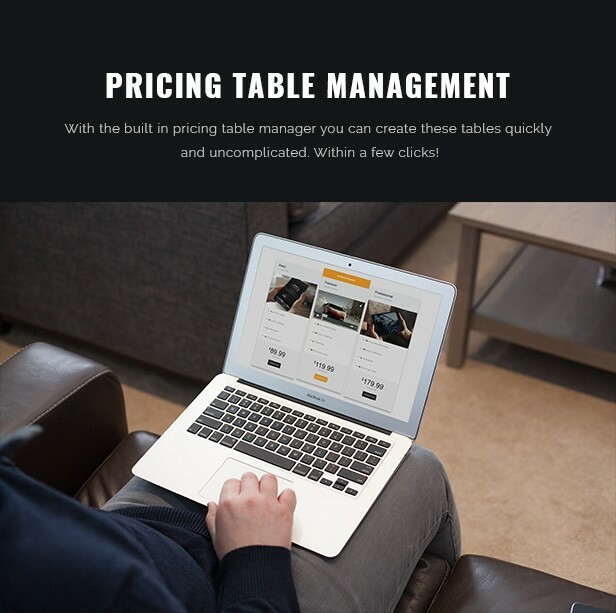 United Themes have been in the web design and development business for years and provide top quality support for every client. We provide our support for all themes via our HelpDesk which features a forum packed full of helpful comments by the community, a ticket system helpdesk and we usually smash our average response time of under 24hrs. We “UNITED THEMES” cordially thank the following sources for providing high quality digital goods! Images are not included with your purchase!